My family’s vegetarian, so our meals never fall into the classic “meat and two veg” pattern many of us grew up with, but most of our suppers still do offer something recognizable as a main dish and some other things that are clearly the sides. But not always. 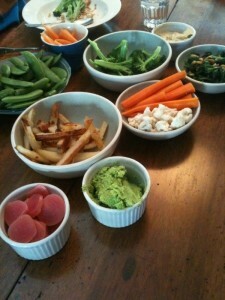 I’ve written in the past about a dinner the boys and I make together sometimes when Tony is out, a sort of vegetable buffet, and recently we did a springtime version: pickled carrots, beets, and cauliflower, roasted new potatoes, snap peas, steamed broccoli with lemon, spinach with pine nuts and raisins, fava bean puree, and hummus. A little bread and cheese might have rounded it out nicely, but we happened not to have any, and the kids were happy to dip vegetables into the purees (or even, in Eli’s case, just eat hummus by the spoonful). It felt like a picnic, and on a foggy night in San Francisco, the bright colors and distinct flavors brought a little splash of sunshine into the room. We have a similar meal about once a week ourselves (last night in fact). OK, I’ve never been a fan of pickled beets, but your posts (and the presence of lovely beets in the farmer’s market) convinced me to try. I made these tonight: http://simplyrecipes.com/recipes/pickled_beets/ and they were fantastic! (well, not that the kids even tried them, but Mark and I loved the.) So thanks for the inspiration!